While preparing for her move from Chodds Farmhouse in the High Street, Handcross, my mother has come across an A Level history project of mine from the 1987/88 school year. 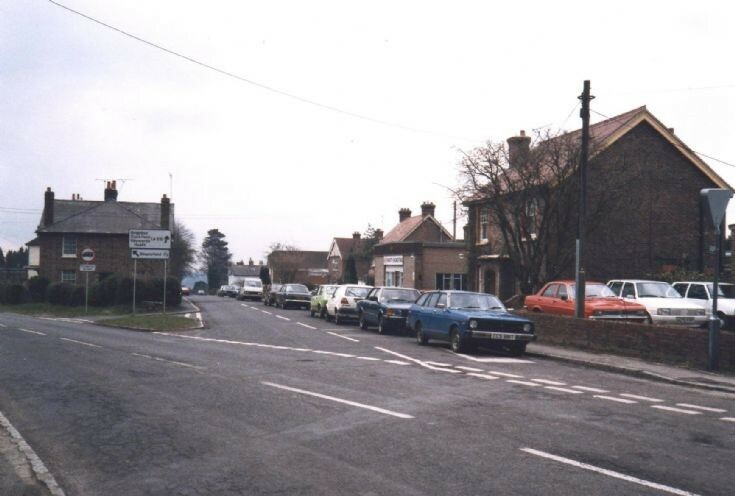 The finished project consisted of several pages of text relating to the history of old Handcross, to which I added 21 photographs of Handcross taken by me to record how the village looked in 1988. Most views of the High Street are easily recognisable but many of the shops now have different names and the cars are clearly from a different era! The project material has now been scanned and will appear over the next seven pages. This picture is of the Brighton Road with many employees of the nearby industrial buildings parking their cars on the roadside. The Large Version shows one of the factories used by a firm by the name of Ellis. Select Open Document to view extracts from the Poor Rates registers from 1769 for residents living in properties on the Nymans estate. It is interesting to note that Old House (picture #49) was once called Little Bechleys. The car park in Brighton Road is up for sale according to the Mid Sussex Times. The guide price is £65,000+ plus VAT, fees and costs. We need to save the car park as it is the only one in the village near the shops and for use by local residents. Hi Judy. Who owns it? In the paper it is Mid Sussex District Council. Judy and Karen, I have heard that the land is owned by Mid Sussex District Council and certainly it is they who operate the site as a car park. I have added the MSDC advertisement to the end of the PDF file. Click on Open Document to view. There is a parking time limit of 23 hours and it has been known that some vehicle owners have received penalty notices from MSDC for exceeding the permitted number of hours. In 1939 a wooden building was erected on the land by East Sussex County Council to provide an office for the engineer working on the new Handcross bridge and bypass. The office was later used by the local scout troop and cub pack as their headquarters. Whether this means that West Sussex County Council is, or was, somehow involved in the ownership I am not sure. Of course, the boundary between East and West Sussex was changed in the 1950s and the village found itself in West Sussex. There are more details of this on picture #1545.